Pretty in pink! I am love with the office space in my new office. It’s the perfect place for me to create, do vinyl orders and even sit and watch Friends. For real. 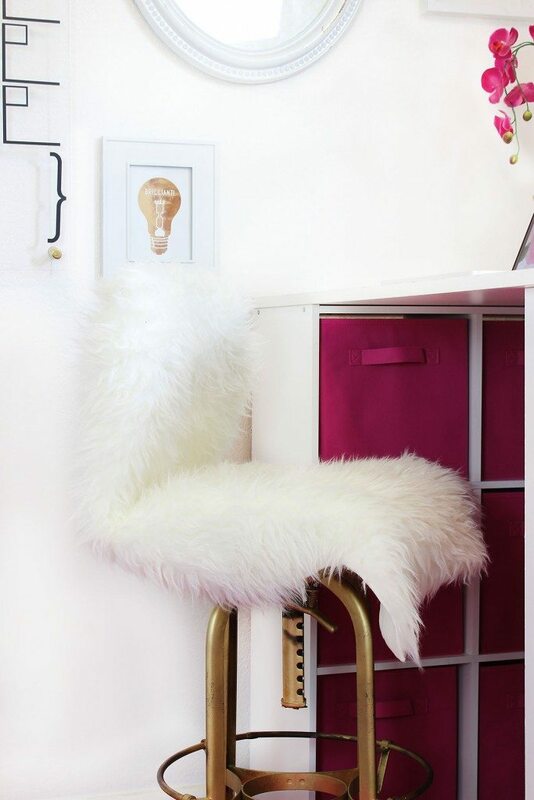 I did bright white and pops of pink and gold throughout the room and I love the turn out. I painted the swash of pink and added my custom made Classy Clutter sign from LetterCraft. My favorite woodworking artists and my neighbors! I used my glittered CREATE letters again from my old craft room, watercolored the flamingo and made a few prints using Heidi Swapp’s Minc Machine. I mean, the gold foiled leopard is my favorite! For the craft island, I took 4 cube organizers and used a huge sheet of melamine on the top and screwed them all together. 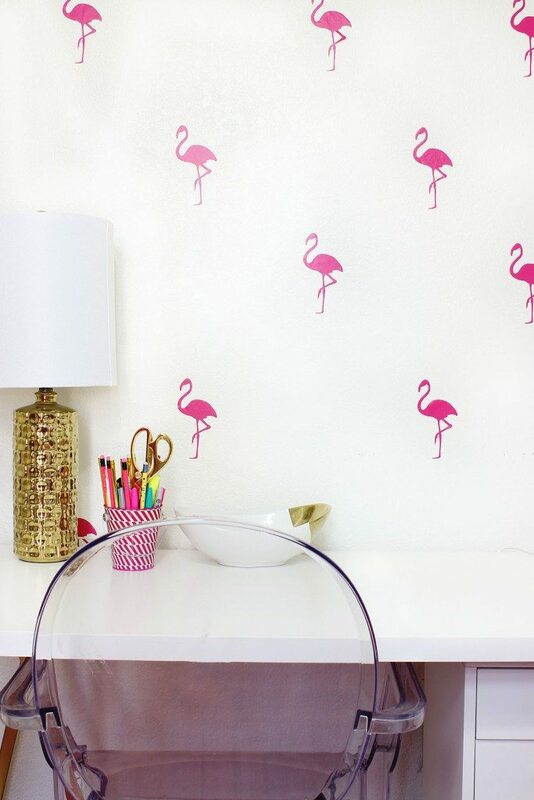 The flamingo details just make me so happy! You can purchase them from my MIL’s shop here. The chair is from HomeGoods, furry pillow is from is from Amazon. The desk is from Ikea. One of my favorite rugs of all time is this pink overdyed rug from RugsUSA. It’s 70% off right now!!! I found this amazing chair on the side of the road in Buffalo, New York but it was super beat up so I cleaned it and sprayed it gold. I threw a faux fur rug overtop to make it extra comfy! I run a vinyl shop on Etsy and here is my stash of vinyl. I keep it tucked in the closet with all of my shipping supplies. Heidi Swapp hand wrote this cute print for me last year at Snap (she made one for each attendee!!!) and I love it soooo much so I had to include it in the gallery. She’s the best! 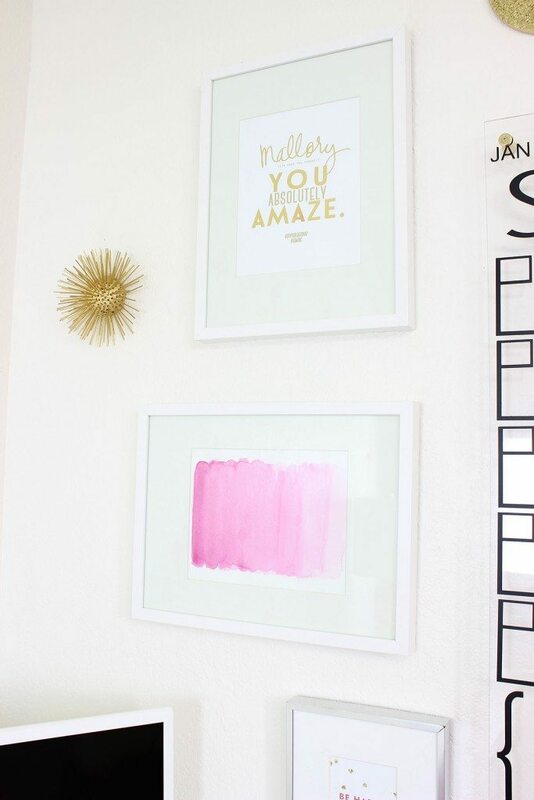 I also watercolored the cute pink gradient below it for easy and inexpensive art. Plus I love watercoloring but I’m super new to it so it was fun to play with the paints and water. I love this space so much and I have enjoyed creating and working in here everyday! Do you have a retreat for yourself in your home? Super cute!! 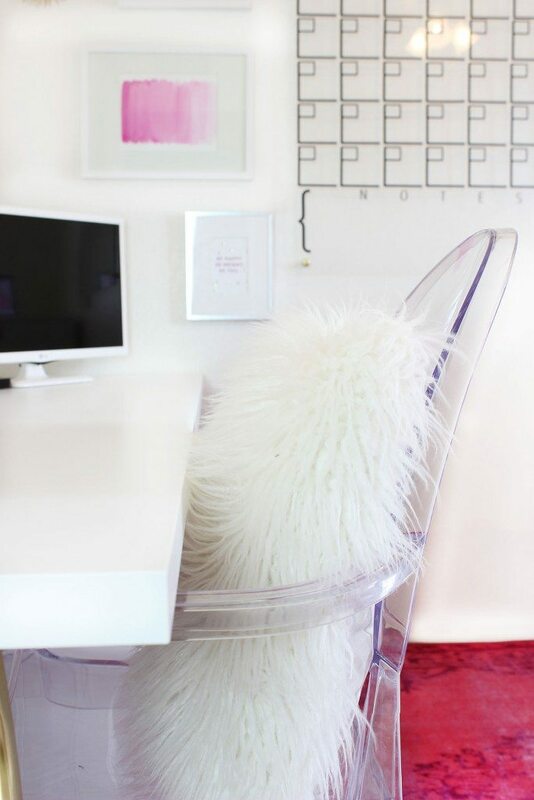 And I am DYING over that office stool you found on the side of the road…..WHAT?!?!?! I LOVE this space! 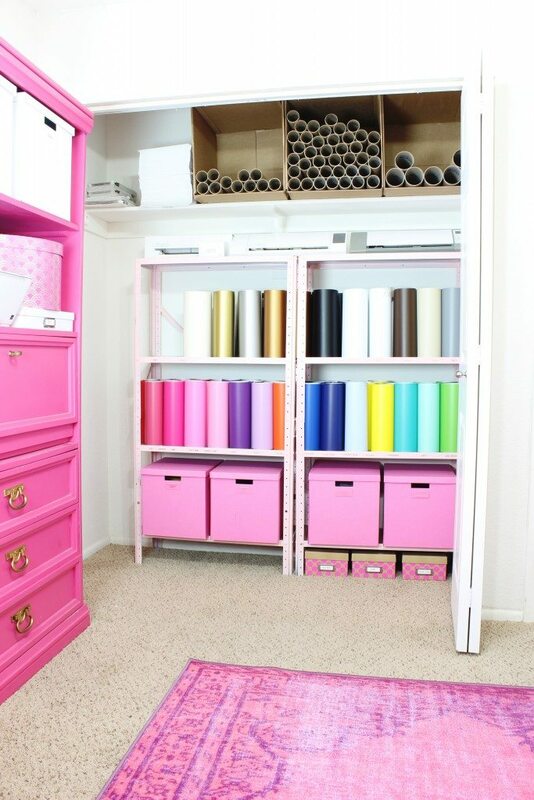 I wish I had an area like this that I could make all girly! I love, love, love it. The pink is amazing. Good article. This is what we closely did in our blue dart courier office. Wow, really elegant. Would love to design this for my kids. 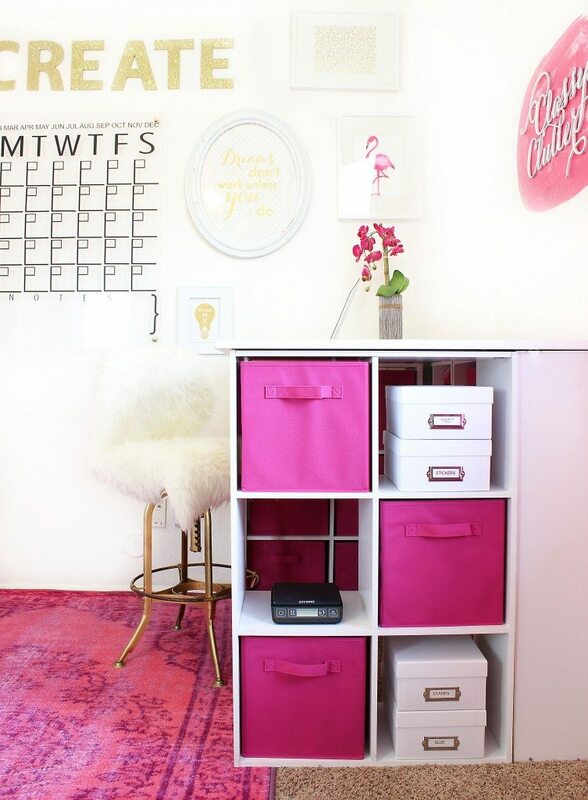 I love the pinks and how light and bright it is in this space! Just beautiful and it makes me so inspired! I can image how creative you can be in such a beautiful space! 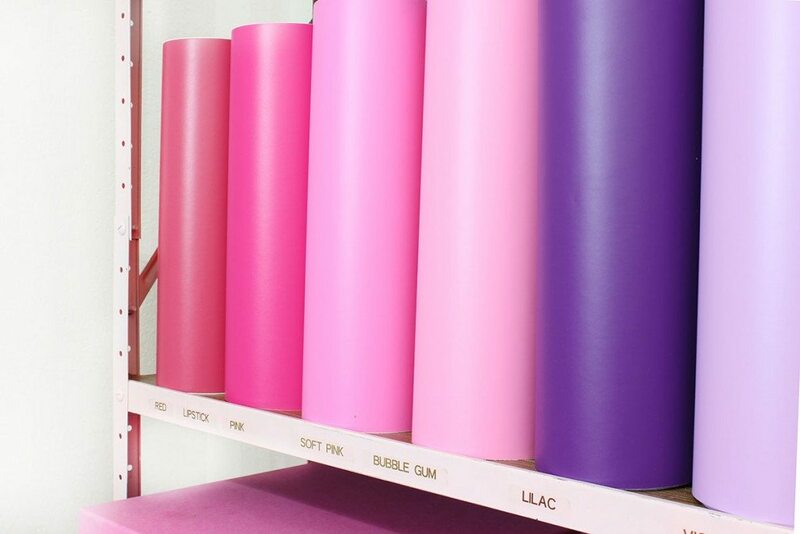 Pink is awesome for girls. My wife really loves Pink theme and thanks for giving me this idea to give as a gift to my wife on this upcoming birthday. very beautiful design and colour. i just loved it!!!!! Wow, amazing designs and idea. Looks Classy. This room is sooo adorable! 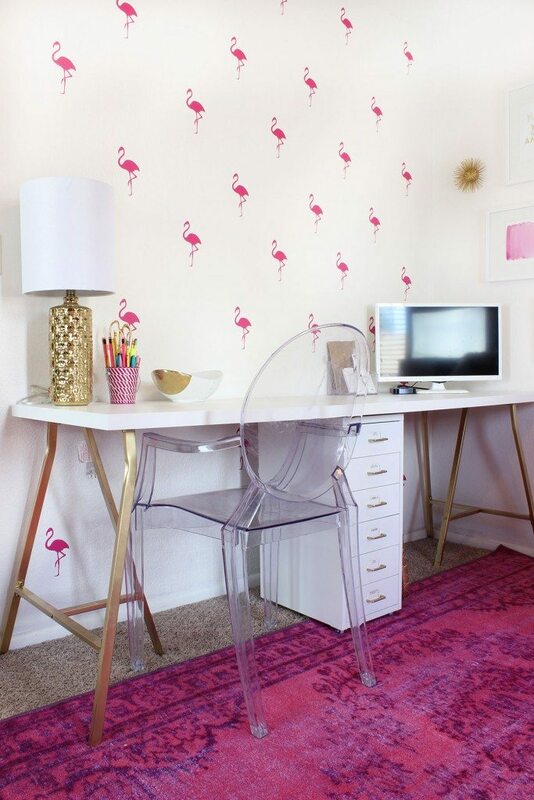 I’m contemplating a room redo in my home office and this is so inspiring! 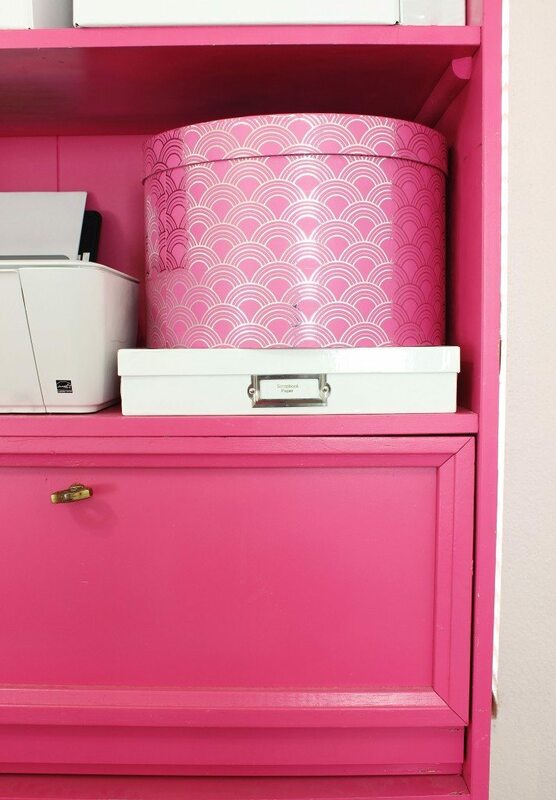 I love the white with the pops of fun pink and gold. 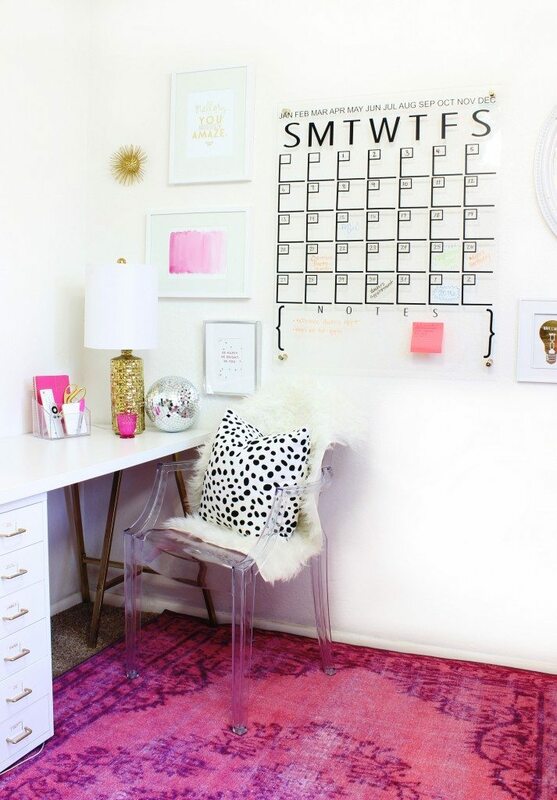 The acrylic wall calendar is fab. Great idea! Keeps the space larger.